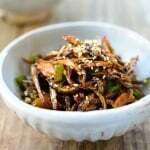 Ojingeochae (o-jing-eo-chae, 오징어채) is dried squid that’s shredded and processed with seasoning such as sugar and salt. It’s slightly sweet with a hint of saltiness. 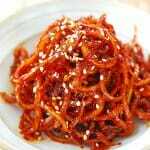 Ojingeo is squid, and chae means shredded or julienned. 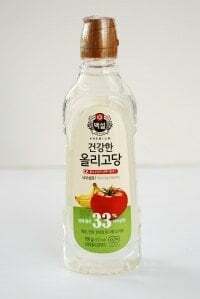 It’s also called jinmichae (진미채). Jinmi means tasty. 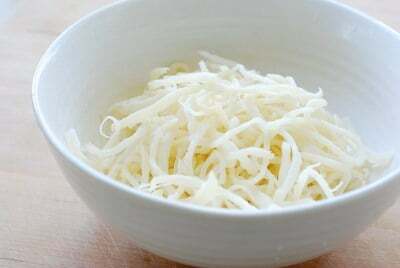 It’s commonly enjoyed as a snack on its own, especially when drinking alcohol, and also used as an ingredient for a side dish. 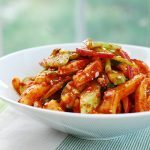 Like myeolchi bokkeum, kongjang, and jangjorim, this ojingeochae muchim (오징어채 무침) is a side dish that’s made to last long and served with every meal over several days (called mitbanchan, 밑반찬, meaning basic side dishes). 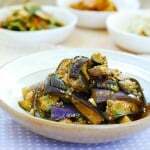 To make this side dish, there are various ways Korean cooks soften this dried squid. I use a little bit of water to wet the squid to rehydrate. 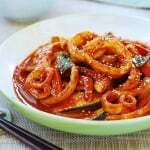 The squid will lose its flavor if submerged in water too long. Steaming the squid briefly works well too. 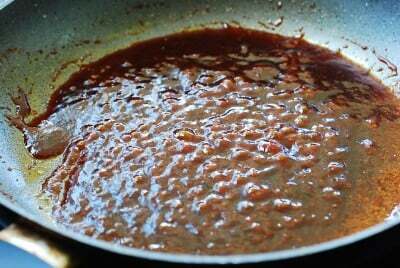 For the seasoning, I first make chili oil by mixing gochugaru (Korean red chili pepper flakes) with heated oil. 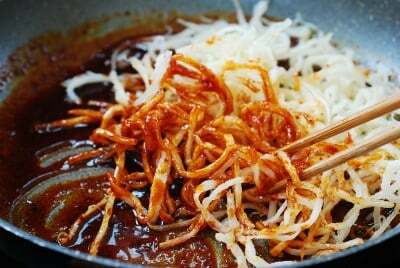 Then, add gochujang (Korean red chili pepper paste) and other ingredients, and bring everything to a boil only up until it bubbles up. This will meld all the ingredients together. The important thing to remember is to cool the mixture before adding the squid. If added to the hot sauce, the squid will cook and get rubbery. 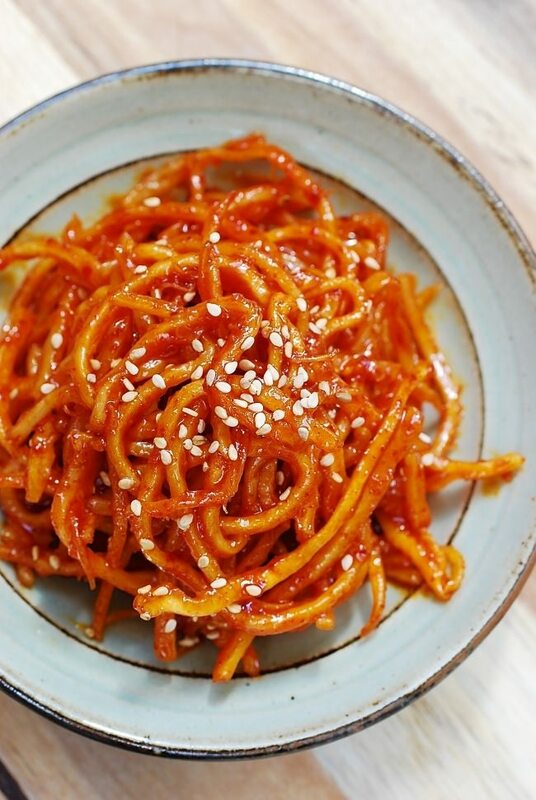 This is why it’s called muchim (mixed), not bokkeum (stir-fried). 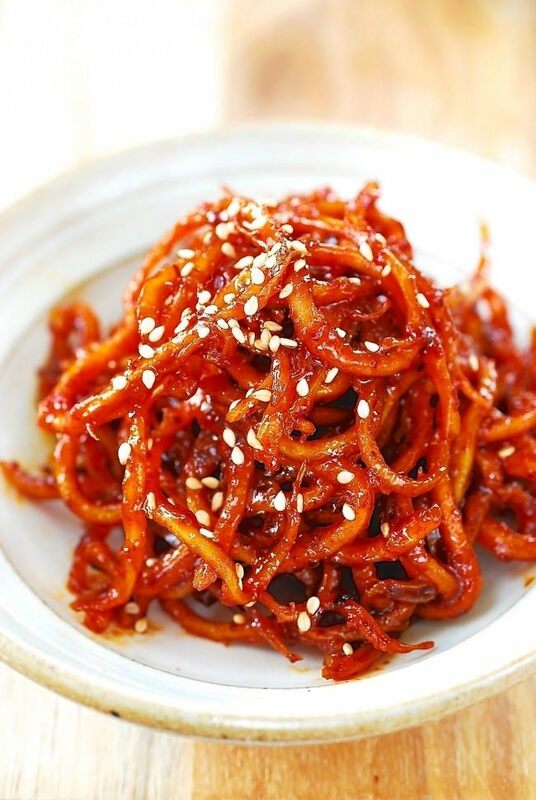 Enjoy this chewy, sweet and spicy dried squid with any of your Korean meals. 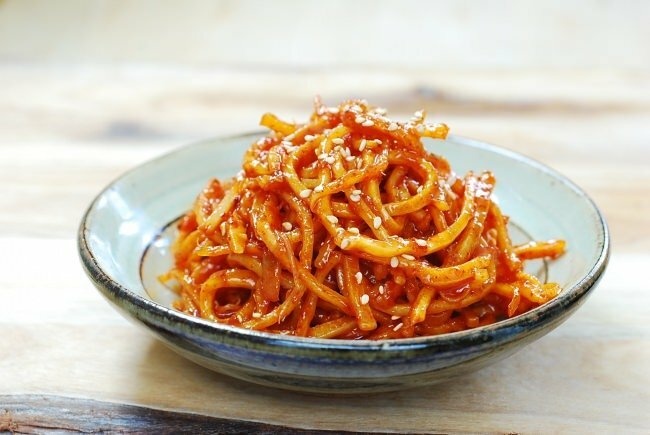 It’s also delicious with a simple bowl of rice or in gimbap! 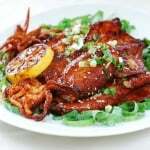 dried squid strips seasoned with a sweet and spicy sauce! Cut the dried squid strings into shorter lengths with kitchen scissors. Rinse in cold water, and drain. Add 1/2 cup of water, and cover. Set it aside until softened, about 20 minutes, flipping over once. In a pan, heat one and a half tablespoons of oil, until hot, over low heat and stir in the chili pepper flakes. Remove from the heat when it becomes pasty. Add the gochujang, corn syrup, soy sauce, and minced garlic. Over medium heat, bring the sauce mixture to a boil, stirring well. 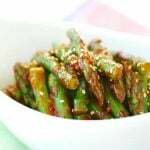 Turn the heat off, and stir in sesame oil and sesame seeds. Cool the sauce. Squeeze the excess water from the squid, and toss well with the sauce. The squid will absorb the sauce better if you massage everything together by hand, using a kitchen glove. Keep the leftovers in the fridge. It will keep well for a couple of weeks. 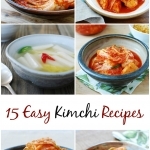 I think this recipe is great! I have made it many times and have always been satisfied with the results. 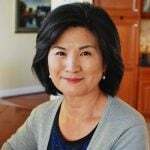 The one recommendation I would make would be not soak the squid in the water as long because it gets really hard to chew. Though, overall it is a great recipe.